This is an older article, but it is still relevant: “NEXT-GEN BIM: Graphisoft Teamwork 2.0 will revolutionize BIM/IPD workflow and collaboration” by Jerry Laiserin, July 2009. This is an interesting introduction and analysis of how BIM authoring tools approach project sharing and collaboration where the goal is to enable greater project integration without sacrificing workflow flexibility. The article also brings up an interesting point regarding how worksharing capabilities tend to benefit larger firms/projects while penalizing smaller firms/projects with unnecessary management complexity. This article focuses on the [new] teamwork framework for Graphisoft’s ArchiCAD 13. Although I’m personally biased towards Autodesk’s Revit suite, I think they could learn a thing or two from Graphisoft’s approach and I think they are going in this direction (if not already with v2011). For more information on this topic, see Chapter 3 of my thesis discussing BIM/IPD and comparing various BIM technologies. I came across this article about affordable ‘green’ housing developments in Oregon and Arizona. This is positive news in a time of economic recession, but I’m not sure what the builders of these homes (or author) considers “affordable” – the Oregon housing development has housing units starting at $257,900 while the Arizona development begins at $174,900 – is this at least 80% MFI? I doubt it. The Alley Flat Initiative case study in Austin Texas, which I discuss in Chapter 4 of my thesis, has been able to achieve 60% MFI at $100,000 for a one-bedroom house. The energy bills are estimated at $734 annually for the 1,640 square foot (smallest) Arizona development home. This might sound impressive, until you look at the Passive House standards, which would cut utility costs down significantly (<$100 annually). But the increase in design/construction quality would undoubtedly increase the upfront housing costs. I believe the way to get around this dilemma is for builders/architects to work directly with local city governments and utility companies to help subsidize the cost of housing developments if they can be proven to achieve an energy efficiency target (net-zero for example). This would enable housing to be more affordable without sacrificing quality and it would be a direct benefit to all stakeholders involved – the builder/architect can charge more for providing ‘green’ housing and the city and utility companies can reduce peak energy demand. In addition, if builders, city governments and utility companies utilized the capacity of Building Information Modeling (BIM) for the design, construction and data collection for these housing developments – thinking about housing units as part of a greater interdependent ecosystem, rather than as individual and isolated buildings – it would assist in quantifying and tracking actual energy usage while provide a baseline for improvement. I attended Autodesk University 2009 where they presented the initial concept for this and demonstrated how social interaction could happen. Essentially, it is a Facebook-like environment with a members list, online chat and project folders. 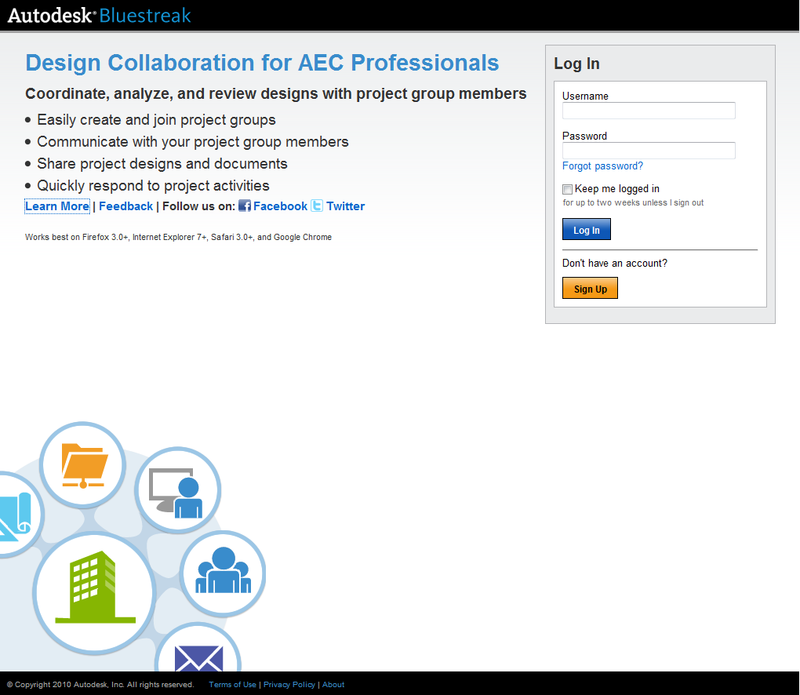 At that time, Project Bluestreak was envisioned as more of a social collaboration tool and not a full “enterprise solution” (i.e. online BIM server). It might be going in that direction, but who knows. Although this online networking tool is a promising step forward in terms of increasing design information access and feedback loops, there is still the challenge of jargon translation and universal meaning (ex. I talk about the need for a “green” roof in the design – one person might interpret that as painting the roof the color “green” and someone else might understand it [correctly] as a vegetated roofing system). While people familiar with architectural jargon may not have a problem communicating amongst one another, the challenge is broadening the conversation to include stakeholders outside the design team proper, who may also be valuable contributors. Refer to Chapter 5 of my thesis where I discuss some interesting research done by Dammann & Elle (2006) on the subject. I’d be interested to see what other BIM developers are coming up with to address stakeholder collaboration and improve feedback loops. Anyone? Finally, a seventh area of research involves analyzing social relationships between stakeholder groups and the communication interfaces linked to BIM models. One challenge with the AFI, for example, has been to create a design communication methodology that is transparent and universal. Based on research conducted by Dammann & Elle (2006), it is unlikely that a universal indicator language will be developed in the near future. One step towards this ideal common language, (as I explained in Chapter 5) is currently being explored by Autodesk in the form of a web-based social interface for project teams that would allow for quick and easy collaboration and document sharing. Unfortunately, this type collaborative tool is still under development and it is unclear if multiple interfaces will be developed to cater towards specific stakeholder needs and if these interfaces will be able to “translate” and facilitate the integration of various types of user knowledge. Furthermore, it is unclear if future BIM social networking interfaces will be proprietary (specific to certain BIM platforms), or if they will support multiple platforms. This would require greater in-depth research about stakeholder project needs with regard to specific project type(s), including affordable/sustainable housing. Similar to comparing BIM platforms as suggested earlier under future research topic five, it would be worth comparing various web-based interfaces in terms of accessibility, programming, maintenance, and compatibility to name a few. The development of stakeholder interfaces might lead to greater design and construction transparency in addition to faster project development timelines due to increased access to information.